Used as an industry standard for maintaining and cultivating recombinant strains of E. coli in molecular microbiology procedures. This covers the preparation of plasmid DNA and recombinant proteins. The LB agar plates are ready to use and provided with a Certificate of Analysis (CoA). Choose from a large selection of ready prepared LB broths and agar plates with or without antibiotics or additives. 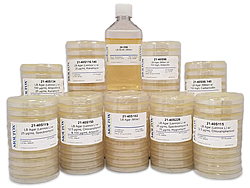 Minimal Glucose Agar (MGA) is a selective media widely used for bacterial Ames mutagenicity assays that utilize bacteria to test whether a given chemical is mutagenic and therefore may act as a carcinogen. Quality control by growth and colony formation test with S. typhimurium TA100 as described by Maron & Ames. 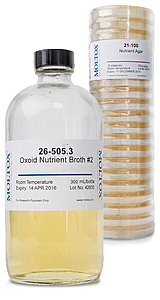 Nutrient Broth Bacterial Media are used in many laboratory procedures for microbiological culture. It is regularly used for enumeration, isolation and enrichment of non-fastidious microorganisms. Tryptic Soy Agar / Broth is also known as TSA or Trypticase Soy Agar. Typically it is used for the isolation and cultivation of fastidious and non-fastidious microorganisms. As a general-purpose, nonselective media it provides enough nutrients for a wide variety of microorganisms. Tryptic Soy Agar contains enzymatic digests of casein and soybean meal, which provide amino acids and other nitrogenous substances. 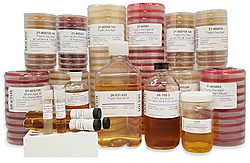 TSA is frequently the base medium of other agar plate types. For example, blood agar plates (BAP) are made by enriching TSA plates with defibrinated sheep blood. Chocolate agar is made through additional cooking of BAP.